I’ve written a book about React, React in Action for Manning Publications! I’m thankful to have been able to work on it and fulfill a life-goal of mine. If you’re reading this post, you probably either made your way here from somewhere on the internet or you’re reading React in Action and were directed here from the book. One of my goals for the book is to give the reader a sense of React that isn’t bogged down in jargon and is instead rooted in solid concepts and practical examples. Another goal I had is to help the reader get a sense for the topology of the broader React ecosystem. This is a difficult thing to do because the community is so broad and multifaceted that I knew I would inevitably present my vantage point of the React community. Not having a way around this, I hope I can still help you get a better sense of the community. This post has one overall map ( svg | png | webp ) that tries to illustrate the React community in a fun sort of way. 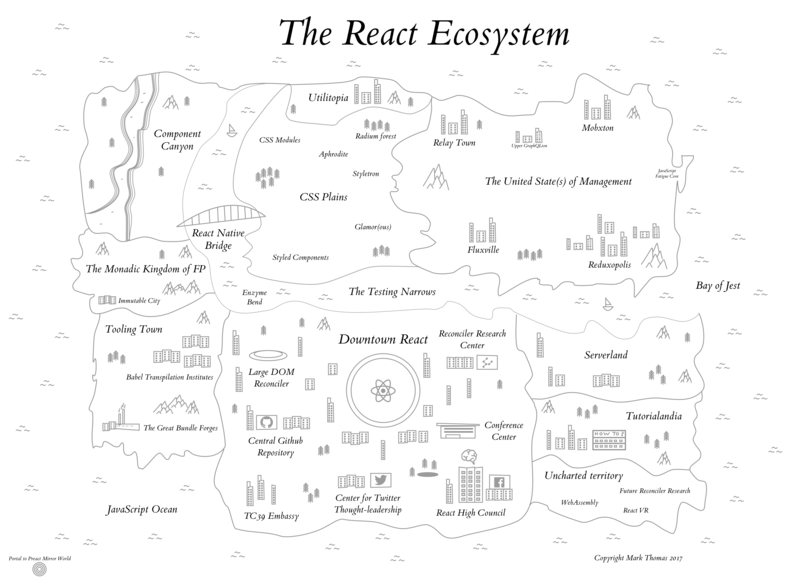 Each section in the map has a corresponding section that will tell you a little bit about the area. This is by no means exhaustive and I am working to add more links to it as I find them and have time. There seems to be a sort of nexus in most open-source communities. In my experience, it tends to center around the core team (if there is one), conferences where key people in the community speak, the Twitter interactions of influential community members, and, as more of a background force, the companies that sponsor or build the technology. [JSConfUS 2013] Tom Occhino and Jordan Walke: JS Apps at Facebook - where it all began! There are some crazy, mad-science areas of the React communities where some really cool stuff happens. People are using React for things you never would’ve thought you would or could. As React has found more use on the server (via the node.js runtime), the React communities have created a handful of frameworks and resources dedicated to using React on the server.